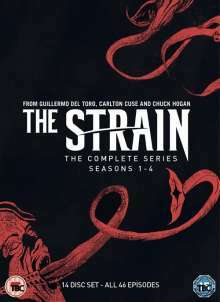 Der Artikel The Strain - Complete Series (UK Import) wurde in den Warenkorb gelegt. American horror drama starring Corey Stoll and David Bradley. When a plane lands at John F. Kennedy Airport with no lights on and the doors sealed shut, Dr Ephraim Goodweather (Stoll) and his team of epidemiologists are consulted and asked to investigate. When they discover that 206 of the 210 passengers on board are dead, the four remaining survivors are their only hope of finding out what happened on the plane.